Day 1- Can I Take a Baby Elephant Home Please? This morning (our first morning here after a 31 hour travel day) we woke up and got ready for our first day of this adventure. We drove through Nairobi into a more rural area where warthogs ran through the bushes and Baboons sat on the side of the road. We arrived at an elephant orphanage where zookeepers take in orphaned elephants (aging anywhere from a few weeks to a few years old) and raise them until they can be integrated into a herd in the wild. We were directed to an area in the back of the compound where it opened up to a beautiful view of the grasslands as far as the eye can see (imagine the Pride Lands from the movie The Lion King). We are told to stand behind a rope no thicker than my pinky finger and within 5 minutes elephant only the size of small dogs come running into the roped off area! The keepers feed the elephants from bottles as we are told that if we are quiet, the elephants will come toward us and we may touch them. Larger elephants then come rushing into the small roped off area where they are promptly fed by their keepers and begin rolling in the mud hole inside the area. They played in the water, splashing and spraying mud everywhere, my sister Grace ended up with a good coat of thick orange mud (and quite possibly poop) covering the front of her. I found this rather amusing, she however, thought otherwise. 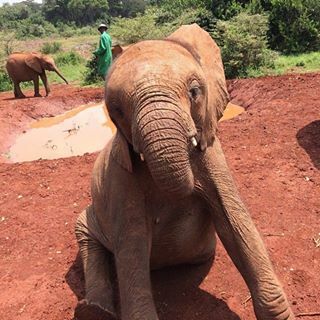 But how often do you get sprayed with mud by a baby elephant? Anyway, the elephants walked paraded around the area, often coming close enough to let us pet them! I praise God for his creativity in creating such funny and beautiful creatures! This morning I woke up to sun leaking through the blinds to my dorm room window. Though I usually would not be so keen on being woken up before my alarm, it was the first time that I had woken up to sun this entire school year. Opening the blinds I was actually excited to walk to a meeting at church I had this afternoon, I even left early so that I could have extra time to bask in the elusive Northwestern sunshine. As I walked I praised God, thanking Him for the wonderful weather and enjoying the lovely smell of blossoming cherry trees that surround my area. Before my meeting I stood outside in the warm sun (I even dared to remove the jacket that I had worn) that was reminiscent of the weather played a role in the majority of my favorite adventures. I stumbled upon the memories of my families trip to Kenya in 2009. 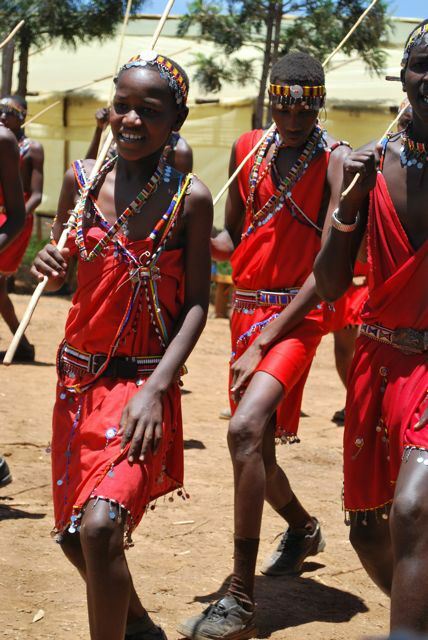 Sitting on wooden benches under the scorching sun of the Masai Mara shaded only by a thinning acacia tree my family watched in awe of the traditional dances of the Masai tribe that the small children of the Compassion project were preforming for us. Their colorful beaded jewelry jingled as they danced and their bare feet stomped the dry orange dirt keeping perfect time. They sang as they danced. The bench hard underneath me, the bright sun melting the sunscreen on my too-easily-burnt skin, sweating in my long skirt, and occasionally coughing at the clouds of the orange dirt that surrounded us, the longer I sat their the brighter I smiled. Taken completely out of my accustomed surrounds of green grass, squirrels, evergreen trees, and snow topped mountains, I saw God in a shockingly new way. In this place, this land of lions and giraffes and droughts and the burning equator sun, I did could not understand God. He did not work the way I knew Him to work. Here, He is the God that encourages the church to protect young girls from marriage at the age of twelve, He is the God that convicts men to take only one wife, He is the God of the woman with ten children in a mud hut praying for her children to be educated, He is the God that families rely on to provide food and water, He is the God of the persecuted church, He is a big God. In two weeks I will be back in Kenya, back on the Masai Mara, back to the land where giraffes and zebras freely roam, back where people live in mud-hut-villages and need to defend their cattle from lions, where little children humble me with their faith, and God blows my mind with just how big He is. As I basked in the sunshine today I remembered that the same sun shines down on the Kenyan savanna, and the God that I chat with on my walks to church is the same God that a little Masai boy chats with as he herds cattle. And as I stood in that sunshine, I couldn’t contain my excitement for this return adventure. I simply cannot wait to hold those beautiful children whom God loves so much and to sing and dance with them, praising the God that we both know and love. Thank you God for the sunshine today, that sunshine in 2009, and the sunshine in two weeks.